I’m a writer; I’m a daydreamer. I wonder, fantasize and sensationalize; my imagination runs so wild I exhaust myself. I weave thoughts, ideas, and scenarios into something bigger and bolder than what they could ever be in real life. I embrace the romantic, quirky and humorous sides of life – the tragic and sad although is not welcomed, is part of the deal. They’re all what makes humans go ‘round; what makes a story, a story. And all this happens all day every day, wherever I am and wherever I go. The goal? To eventually make it all come together into something I hope readers will enjoy. And where does it come together? Where I write. When I’m invited to a fellow author’s home I’m always intrigued (and perhaps a tad nosy) about where they write. 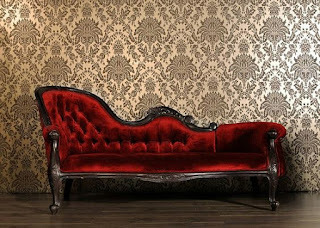 I have visions of my author-friend lounging on a red velvet chaise lounge or at a gold-trimmed desk writing novel after novel without shedding a tear, uttering a blue word, or sputtering a frustrated sigh, all while looking fabulously put together. And yes, I’m sarcastic, too. And although I have yet to see a red velvet chaise lounge or gold-trimmed desk, I’m always very impressed by those whose writing spaces I have been so fortunate to see (I tend to excuse myself from gatherings in search of the ‘washroom’ so I can stealthily search for said writing space). They usually have an office with a desk; indeed a room to call their own. They often have a door they can shut out the distractions of the world, and peace and quiet is at their disposal. I know this doesn’t go for all writers – many write in coffee shops or libraries, their homes too busy or small to foster great literary achievements. I know I have done the same – Starbucks down the road has been my go-to place many times. But I still ignore reality and insist on thinking everyone has a better place than I do. I still envision other writers – both immediate friends and those who I admire from afar – writing in a cozy, decorated, dreamy place. A cute little office, a cabin, a castle in the clouds, or a cozy nook in their basement complete with a candy vending machine where they don’t have to pay a dime for needed-for-writing sugary treats. I dream of places I would love to write – where I know, JUST KNOW, if I simply HAD that kind of writing environment specific to nurturing my creativity, I would MOST DEFINITELY pen the MOST GREATEST opus of all time. I’ve even collected inspirational photos of places I would love to write on Pinterest – my board aptly called “Dream Writing Spaces.” I dream of castles, cabins, nooks and crannies so remote in the world I doubt the places even really exist. ‘If only...’ is always in the forefront of my imagination. But like I said, I fantasize everything into something sensationally bigger than what it really is, reality not something I often wish to see. It’s always much more fun to think something is bigger or better than what it really is. The truth – how and where most writers really DO write – is, well, kinda boring. I’ve read countless articles of the writers of the bestseller lists who started out writing at their kitchen tables, basements, in their cars, in the men’s washroom and on subways. Yes, yes – I’m ignoring reality. I just want to believe what I want to believe – that THOSE writers are writing in their gold-gilded castles. Fellow writer Norah Bennett writes contemporary women’s fiction for Evernight Publishing, and was kind enough to interview me for her blog. Her question ‘where do you write?’ got me thinking. Where I write is so...so...not writerly cool. There is nothing inspirational, dreamy or romantic about where I write. Other writers won’t be jealous and it’s definitely not Pinterest- worthy by any means. Because when not writing ‘on the go,’ jotting notes in stolen moments on the bus, at my day job, or being a passenger in the car, I write....at my kitchen table. I have no privacy – I don’t have a door. I write when I can in the early hours before everyone gets up. I leave my laptop up and ready-to-go at all times (moved for family meals), and the table is a general catch-all for my busy house of three men. I have done this for years, and the words ‘one day’ hover over me like a little cloud of hope. ‘One day’ I will have my own writing space. 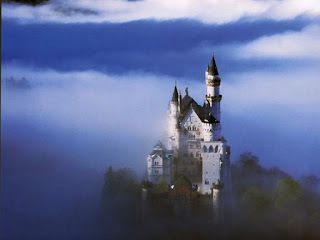 ‘One day’ I will have a castle with a turret in the clouds from which to write. ‘One day’ I will have a red velvet chaise lounge. As I was answering Norah’s question and wrote about what I have and don’t have by way of a writing space, I realized...what I have is perfect for me, in my life, in my NOW. I’m in the hub of the house, aware of what is and is not going on. Sure I have distractions, but without said distractions I wouldn’t have a chance to have a mental break when looking for JUST the right word or sentence for what I’m writing. If I was cut-off from everyone I wouldn’t be inspired – people and most specifically, my family, inspire and fuel my writing. 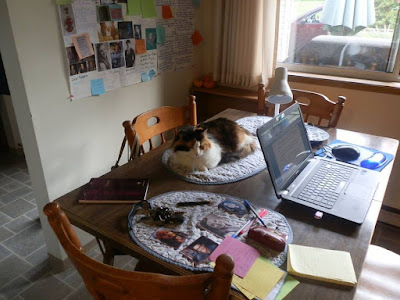 My busy life keeps my writing active, although this busy mom/writer/office worker could sure use a cabin-in-the-woods writing day now and then – peace and quiet to sort out my thoughts would sure help too! I know deep down I’m no different than other writers, and they no different from me. We’re all just trying to get the words down, no matter where we are. Besides, if I had a red velvet chaise lounge I would likely get a backache that would prevent me from writing at all. Castles require climbing lots of stairs – and again, my back. A cabin is often cold and damp, which would lead to more backaches. So I realized that my kitchen table in the centre of my home – my home which is who I am, what with the cat crying for food, someone microwaving their dinner, the sound of the shower, the whir of the clothes dryer and the ringing of the phone – is the perfect place to write...for me. Be sure to visit the site of Norah Bennett www.norahbennett.com and read the full interview here. Thank you, Laura! And thank you for stopping by!